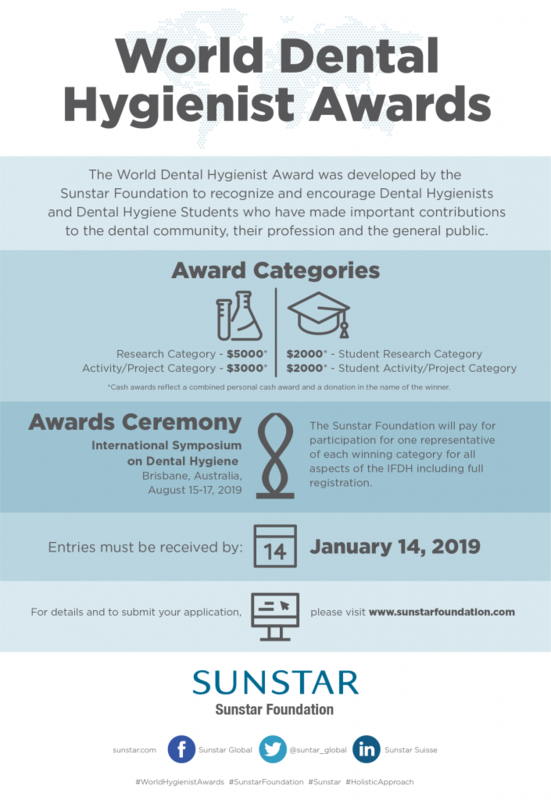 These awards are promoted by the SUNSTAR Foundation to recognise dental hygienists who have made significant contributions to dental hygiene science or patients, the community and the general public. Entries will be accepted until 14th January 2019, and the 2019 Awards Ceremony will be presented in Brisbane, Australia in August. Recipients will be invited to attend the International Symposium of Dental Hygienists (ISDH) in Brisbane (Australia). Entries will be accepted until 14th January 2019, and all applications must be self-submitted through the online form. The World Dental Hygienist Awards are presented at every ISDH to a person or group chosen by an independent Selection Committee. Therefore, the 2019 awards will be presented in Brisbane, Australia. The SUNSTAR Foundation has been promoting better oral health around the world for over thirty years. Also, it has been contributing to research and raising awareness about the two-way relationship between oral health and general health, particularly about periodontal disease and diabetes. Therefore, during all these years, the Foundation has recognised and supported all the players in the oral health field spanning from researchers, dentists and periodontists to dental hygienists and patients.